Heatwave hits the Kitchen Garden! This week in Stephanie’s Kitchen Garden, we will be spending much of our time making sure our crops are happy in the current heatwave. 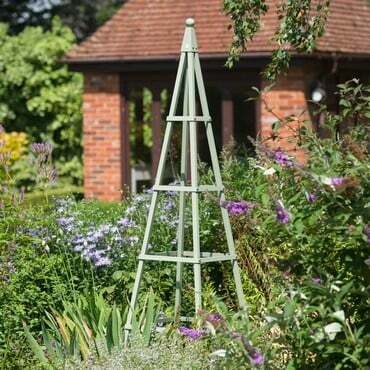 It’s been hot, hot, hot in the garden over the past week and crops and gardeners alike are feeling the effects. This year’s vegetable plants have been used to plenty of water from all the rain we have been experiencing. Now there is no significant rain on the horizon and the sun is baking down on the garden. 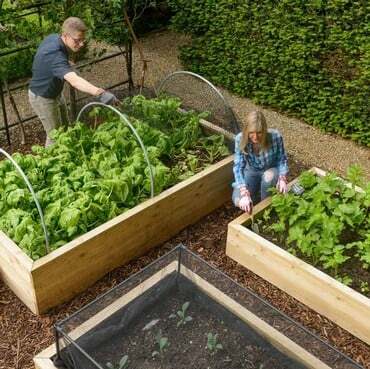 This is great for setting and ripening veg, but will be putting the strain on our leafy crops. 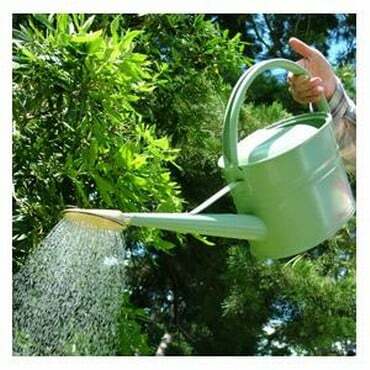 So we will be out in the early morning wiith our watering cans and soaker hoses to make sure the plants are well watered and fed. Our red onions have loved the wet and warm weather and have swelled to a good size. 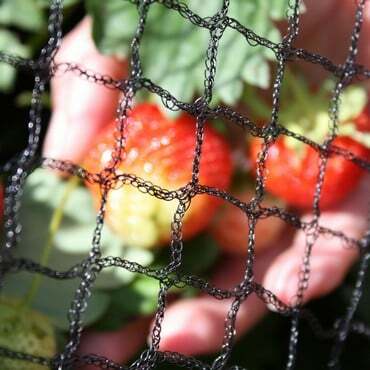 This week we will be digging them up and laying them out in the sun to dry for a few days before storing them in a net in the larder. The current conditions are perfect for this as the hot sun will dry them out quickly and thoroughly. The squash plants growing up a Lichen Green Pyramid Obelisk in our raised bed have put on several fruits and these are starting to swell quite rapidly. Pretty soon, they will become too heavy and break their stems. 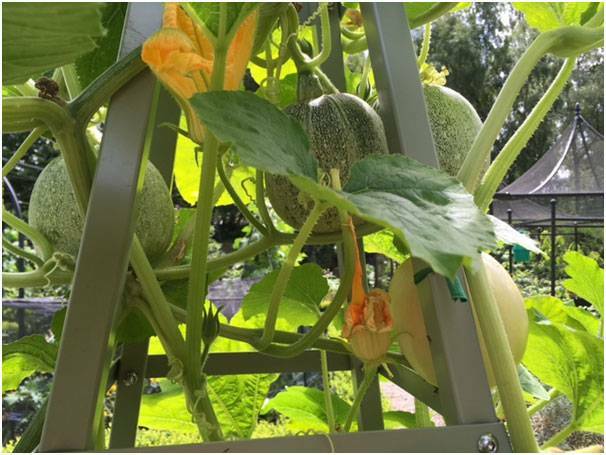 This week, we will make some little hammocks from bird netting which will be attached to the obelisk and cradle the squash safely whilst it continues to grow. 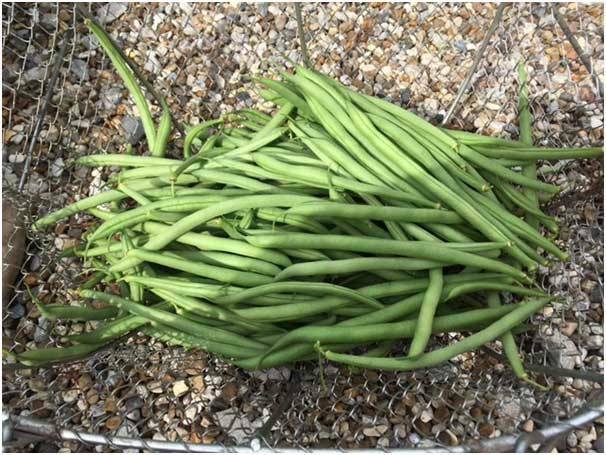 The great bean harvest has started in the Kitchen Garden so this week, we will be out picking them every couple of days to make sure we get them while they are small and tender. This will in turn encourage the plants to continue flowering and set more beans. One of my favourite crops to eat, I’m looking forward to a glut of these this year!